Above & Below: Cyberspace is a subtle shade of baby blue with a touch of grey. All photos are shown using 2 coats and show each shade with a flash and also under an Ott light with no flash. Below: A quick look at what China Glaze Dripping Wet transforms into when using one coat over 3D (the gold shade). You can read more in the post about my experience using these holo glitters as a top or base coat. 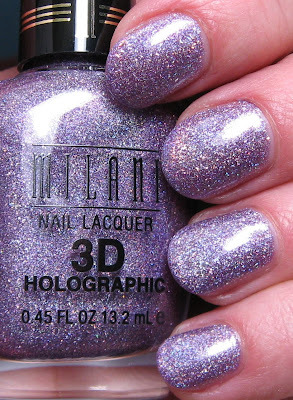 Below: Hi-Res, a light purple or violet shade, really shows off the holographic glitter. All of these shades, other than the silver and gold ones, have a somewhat faded color effect. This is one of the qualities about this collection that I like, because it's just one of the elements that really distinguishes them from other polishes in my collection. Below: 3D is a bright medium toned true gold shade. The silver glitter seems to be more primary in this shade, although there are other colors in it as well. 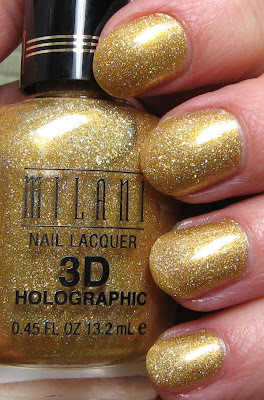 Here are the last of Milani's newest collection called 3D Holographic. There are 6 shades altogether, and the other three can be seen in the post just below this one. As I mentioned yesterday, if you're expecting these to be as holographic as OPI Designer Series or NFU 62, they're not at all close to those. The only one that I really noticed a holographic effect was in Hi-Tech, the green one shown yesterday. The glitter in these is holographic and changes color considerably, so perhaps that's where the 'holo' is supposed to be found, rather than across the entire nail. The more I used these, the more I liked them. They cover nicely in 2 coats and the sparkle and beauty that they radiate is undeniable. This finish is totally distinct and I have yet to find anything in my collection that rivals it. I tried using it over a black base, but the pigment is quite dense, so I didn't get the effect I was looking for. With a little practice and a lighter hand, this may be something that will work out the next time I try it. I then layered one coat of China Glaze Dipping Wet over it, and because the sparkle is so intense, it showed through enough giving me a rather unique look. 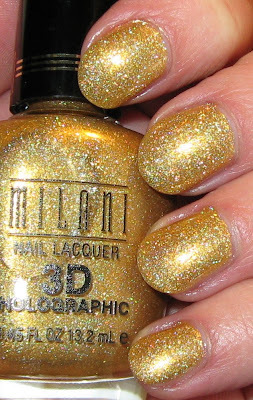 Milani did a fantastic job with this collection, and I look forward to their upcoming offerings. These are beautiful, looks like a great collection! These are pretty...but...holy Batman...where is the HOLO?!? I mean, the green adn the purple one maybe, but the others are not 3D..they are just pretty glitters..ho hum. These are pretty cool; I see Milani all the time at Ulta...now I have to go back and look! Pretty! I had no idea Milani was coming out w/this collection. Are they available in CVS/Walgreen's and other stores like that? Jessica~Glad you like them! I was really impressed with the finish and the shades. Jackie S.~I know, I was disappointed at first, based on the 3D in the name, but after using them, Ii still love them! gildedangel~they really are, aren't they?!! rijaH~I think Cherry Culture carries this brand, as they are US (maybe Canada too?). 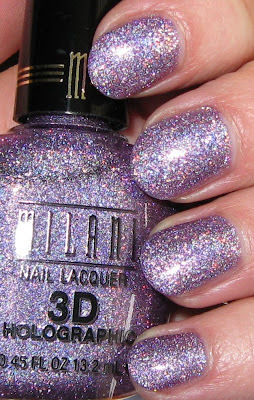 Aurora's Nails~I only had 4 Milani's previously, and they were just so-so, but these are exceptionally nice. PBG~I imagine they will be. Usually they show up at CVS about a month after I see them in Meijer. My Walgreens no longer carries Milani, but I'm not sure if that's a geographical thing or if other Walgreens still carry them. Oh I LOVE them! Especially Hi-Res, that one has me drooling!! 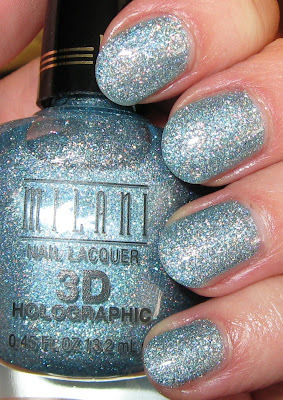 @ PBG...Target carries Milani, thats where I found "Totally Cool", another great polish color! Glittermillie~aren't they interesting? 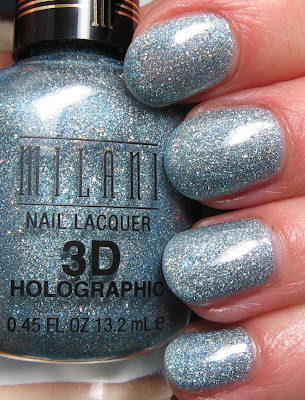 Even if they're not what we think of when we think 'holo', I still love them! Jackie S.~my Target doesn't carry this line, but hopefully others can find them at theirs. Thanks for the tip!